Whether you are a scientist, professor, physician, nurse, practitioner, patient, ombudsman or advocate, your voice is valuable in support of research into the Coley phenomenon. This website is a repository for your signatures and comments. Please read the following and consider adding your voice. For nearly half a century, William B. Coley, MD, published outcomes, frequently cures, of cancer patients he treated with his pioneering immunotherapeutic vaccine. For more than a half century, the vaccine was manufactured by Parke-Davis & Co. For more than a century, scientists and clinical investigators have studied and published findings on Coley’s vaccine. Indeed, Dr. Lloyd Old’s last paper, published posthumously July 30, 2012, was entitled, “Phase I clinical trial of Mixed Bacterial Vaccine (Coley’s Toxins).” Yet, for more than half a century, Coley’s vaccine has been commercially unavailable. Why? A Freedom of Information Act inquiry has revealed the truth, a story of incompetence and confusion involving NIH, Congress and the FDA. In short, in 1955 the National Biological Institute of NIH rushed approval of a contaminated Cutter Laboratories polio vaccine that killed 10 and crippled 192. Congress reacted by transferring regulation of biologics to a newly formed NIH Division of Biologic Standards. The honeymoon was short-lived, halted by a scathing Government Accounting Office report that found 130 of the 221 total lots of flu vaccine approved by DBS between 1966 and 1968 failed to meet DBS’s own standards for potency. Why ask NIH to conduct the research? We’ll tell you. 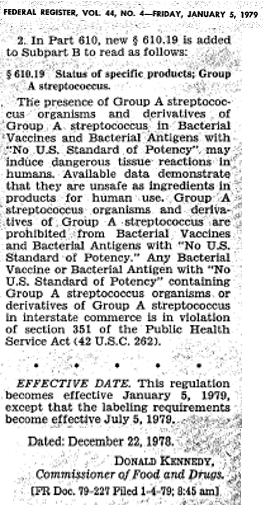 An angry Congress adopted the Consumer Safety Act of 1972, which transferred regulatory authority over biologics from NIH to FDA. To administer the requirements of the 1944 Biologics Act, FDA formed the Bureau of Biologics. Now that FDA was in charge, it decided to apply drug-evaluation standards to biologics, including safety, purity, potency, and efficacy. 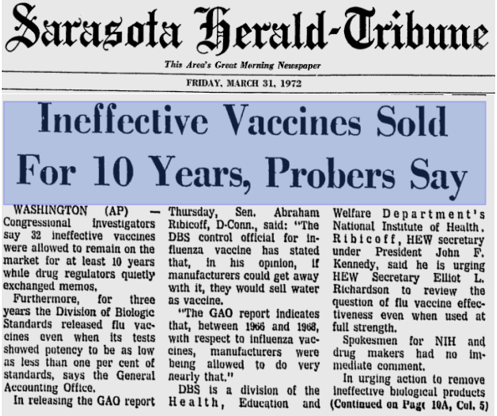 Therefore, it froze and/or revoked almost all therapeutic vaccines and allowed only select manufacturers to move forward with preventive vaccines. The ban on S. pyogenes was not lifted until July of 2006, 27 years after it went into effect. In 1866, Bonn University Chair of Surgery Prof Dr Wilhelm Busch observed tumor regression apparently induced by a Streptococcus pyogenes infection in the surgical bed of an excised tumor. The patient absorbed residual tumors while fighting Strep with repeated high fevers. This was confirmed several decades later by Dr Felix Fehleisen who inoculated 7 patients with live Strep pyogenes. The matter was taken up in earnest by Dr William B Coley in the 1890s. Coley amassed voluminous data, promulgating use of his toxins among colleagues and manufacture of his Coley Fluid by Parke-Davis & Co. The resulting literature is large and continues to expand to this day. One might think that reasonable efforts by any developer would have drawn attention from Big Pharma, but that has not been the case. The key reason for this industry-wide reluctance is that there are deeply rooted lingering effects from FDA’s involvement, a 34-year period during which it would not allow corporate development, of which 27 years were spent holding a policy warning that S. pyogenes would “induce dangerous tissue damage.” The impression that the Coley well is poisoned has endured for so long that it is now received wisdom that there was somehow something wrong with Coley and/or his vaccine. NIH has the resources to conduct the kind of bottom to top research on Coley’s phenomenon that has never been done (largely because it was technically impossible; but that was then). We believe that the time is right to look into this extremely cool but neglected observation. We are in the middle of an elegant paradigm shift in tumor immunology, bellwethered by Dr Polly Matzinger, author of the Danger Model (with Ephraim Fuchs). Like other maturing paradigms, the Danger Model sees its roots in history; in this NIH Videocast, Dr Matzinger discusses William Coley and his remarkably effective mixed-bacterial vaccine. Given that the combined efforts of NIH, FDA and Congress to improve safety and efficacy of biologics inadvertently created inordinate research barriers for Coley’s vaccine per se, it perforce falls on these same players to do the work. All the historical names and faces are out of the picture, but the resources are still there, and there are new fine minds in the system. Do you think that it is reasonable to ask NIH, FDA and HHS to make up for lost time and enable this research? If so, will you please sign this love letter? It is my opinion that the Coley clinical phenomenon is urgently deserving of an investigation informed by the full and appropriate resources and personnel available for taxpayer-funded, public-interest research within the agencies of the US Department of Health and Human Services.